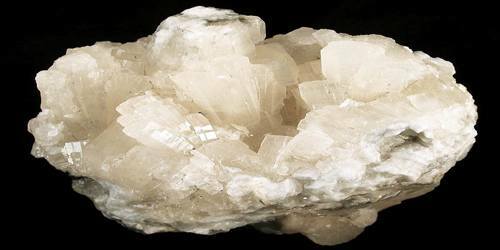 Witherite (BaCO3) is a white, grey, or yellowish mineral consisting of barium carbonate in orthorhombic crystalline form: occurs in veins of lead ore. Witherite crystallizes in the orthorhombic system and virtually always is twinned. The specific gravity is 4.3, which is high for a translucent mineral. It fluoresces light blue under both long- and short-wave UV light, and is phosphorescent under short-wave UV light. It is also formed from Calcite that loses its calcium, and gets replaced by barium, thus forming Witherite in the process. Witherite was named by Abraham Gottlob Werner in honor of William Withering (1741-1799), an English geologist, chemist, botanist, and physician. Withering is credited with the identification of this mineral as a separate species from Barite. Witherite is ordinarily found in fairly pure form in association with barite and galena in low-temperature hydrothermal veins, as in the north of England and in Scotland. 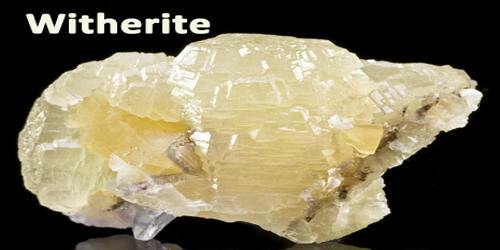 Because of its solubility in common acids, witherite is preferred to barite in the preparation of other barium compounds. It is also used in case-hardening steel and in refining sugar. Witherite forms in low-temperature hydrothermal environments. 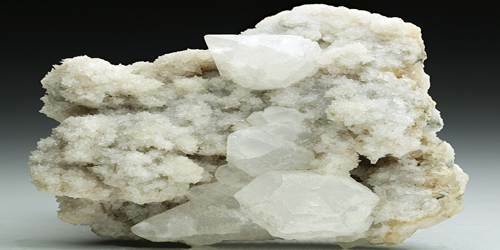 It is commonly associated with fluorite, celestine, galena, barite, calcite, and aragonite. There are not many significant localities for Witherite. The two most noteworthy localities are are the deposits in Alston Moor, North Pennines, Cumbria, England; and the Minerva No. 1 Mine, Cave-in-Rock, Hardin Co., Illinois. Other occurrences are the Fallowfield and Settlingstones Mines, Acomb, near Hexham, Northumberland, England; the Pigeon Roost Mine, Glenwood, Montgomery Co., Arkansas; El Portal, Mariposa Co., California; and Thunder Bay, Ontario, Canada. Its crystals are always almost always twinned, usually in pseudohexagonal Trillings that are bipyramidal, resembling bipyramidal hexagons. Crystals may also be elongated pseudohexagonal Trillings that are not bipyramidal, and are usually scepter shaped. May also be in bladed or tabular crystals. Most crystals have striations on crystals faces, which sometimes may be deep indentations. Witherite also occurs fibrous, grainy, platy, mammilary, columnar, crusty, massive, and as groups of crystals in layers. Witherite is used in the production of glass. Good crystals of this mineral are highly desirable among collectors. The 18th-century naturalist Dr. Leigh recorded its lethal effects after the death of a farmer’s wife and child. James Watt Jnr. experimented with the mineral on animals and he recorded the same lethal properties. Until the 18th century farmers at Anglezarke used the mineral as rat poison.